You don’t have to be a castle-lover to appreciate the Rhine river, but it certainly helps. 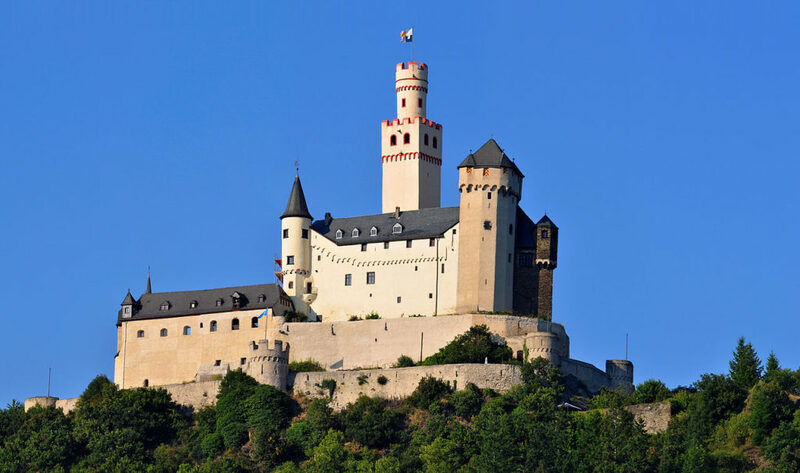 The stretch of active waterway between Bingen and Koblenz, although only approximately 35 miles, has more castles than any other river valley in the world. Since I am a castle-lover from way back, that statistic immediately appealed to me. Can one over-dose on castles…yes, I’ve learned it’s possible. For me four castles, up-close is enough in any given week. I also learned this small segment of the Rhine is considered by many to be the most scenic part of the entire waterway. Off-season airfares may be great for the budget, but what about the weather? Numerous guidebooks assured me the weather for early April should be relatively sunny and in the high 50’s. If we were lucky, a few 60-degree days might happen along. We arrived in Frankfort on April Fools Day and managed to get lost within the airport for a full two hours. The joke was on us. Finally, a bit tired and grumpy, we found our way to the underground transportation. I knew from our preliminary research the tour boats along the Rhine would be running, though less frequently than during the peak summer months. Rather than a set itinerary, we opted for flexibility in case the train or boat schedules didn’t jive with our likes and dislikes. This worked out for us, although I would never attempt it during the summer. After a quick look at Frankfort, we moved on to Cologne by train, so our first real glimpse of the river was from the rails. After several discussions we decided to start at our northern most point and work our way down the Rhine. My spouse had not yet seen the cathedral at Cologne. He was overwhelmed as are most people the first time. Inside we joined a guided tour, which comes highly recommended. It was very cold and damp within the church, which was our first clue the weather wasn’t going to be quite what we’d hoped. Though the next day was sunny, temperatures stayed in the mid-forties, forcing me to don four layers of clothing, including three pairs of socks! We continued south by river boat, the KD Line. There were so many scenic towns along the way, we decided against stopping in Koblenz. Our choice was the small village of St. Goar, which proved an ideal location. When we requested a room at the Hotel Hauser with a Rhine view, we were not disappointed. Our third floor room had a tiny balcony, overlooking the KD boat dock, but best of all, we could see three castles from our window! Due to the season, the room rate was reduced below $100 per night (with full bath) for two people. The staff were all smiles and quite accommodating. From St. Goar, we were in a convenient spot to go either north or south on the KD Line. In addition, the train station was barely a block from our hotel. The weather stayed dry but cold. There wasn’t a single day I didn’t wear my four layers of clothing. On the positive side, we saw only a few scattered tour buses, during our time in St. Goar. Originally, we thought narrowing down which castles to visit would be difficult, but it proved otherwise. One obvious choice was Rheinfels, perched directly above St. Goar. Finding no taxi’s handy, we slowly walked the steep hill to the ruins. Though the views from the top are superb, there’s not much left besides stone walls. There’s a small museum worth a look. We enjoyed Marksburg Castle on another day, however the tour was only given in German. We were given a sheet of English explanations, but missed all the tour guide jokes! We spent one full day on a river boat, seeing the castles from the water and then decided on a day trip to Heidelburg. Our last day was spent on the Moselle at Cochem, which we had to visit by train. Summing up, we found getting around by train and boat in off-season to be easy and efficient. There was never any trouble finding rooms even though we had no advance reservations. The weather, was another matter. If we had to do it over again, I think we’d wait until late May, even if the airfares were higher. The early April weather turned out to be unseasonably colder than usual, at least according to several German people we asked. Even wearing four layers, I came home with a bad case of bronchitis. If you do decide to go in off-season, be sure to get the KD boat schedule before leaving home, as it helps in the planning.